Ainsley is having a great time at St John's Weekday Ministries. They have so many fun activities for the kids and she is learning so much! 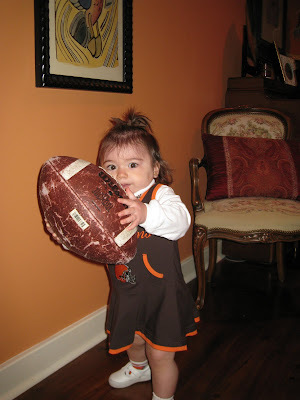 A few weeks ago on a Friday they had football day where all of the kids got to dress up in outfits for their favortie football teams. 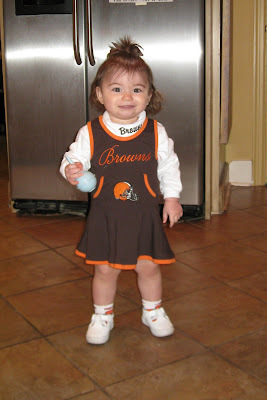 Moss was not very happy with Ole Miss at the time and the Browns had beaten Buffalo the Sunday before so he declared that Ainsley needed to wear to her Browns outfit to football day instead of any of her Ole Miss outfits. 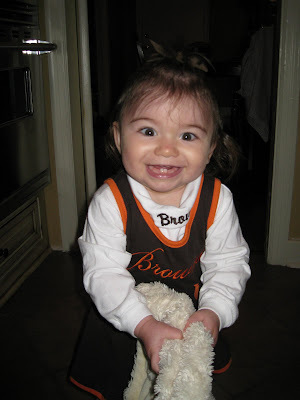 Ainsley was the only child there in Cleveland Browns apparel! Here are some pics.